There are so many different features of Together We Served that it sometimes may be a bit overwhelming. For instance, did you know we have a feature where you can either build a page for a family member from any service or add an existing page to your family? There are many of our members who are the family historians. 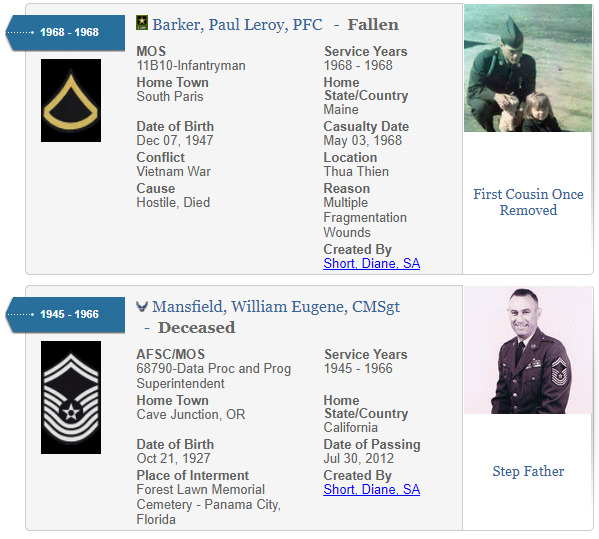 They have clicked on Remember a Veteran and built a page for their ancestors. We have quiet a few profiles that are go back to the Revolutionary War. Even more from the Civil War. We even have a member who is going through his local cemetery to build a page for every veteran buried there. Once you have added members to your family, you’ll see a button under your photo that says Family Who Served. Click it and you will see your family in a brief shadow box format. To see this image in larger format, click here. You can also view a short video here that will walk you through the steps. If you have any difficulties or questions using this feature, contact us on the help desk at the lower left of any TWS page or email us at admin@togetherweserved.com and we will be happy to assist you.